Under a recently signed Letter of Intent, Jeppesen and Continental Airlines have begun working together to define a multi-year Required Navigation Performance (RNP) program. Under a recently signed Letter of Intent, Jeppesen and Continental Airlines have begun working together to define a multi-year Required Navigation Performance (RNP) program. 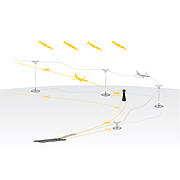 Continental is actively adopting the latest technology for its flight operations, including Electronic Flight Bag (EFB) services from Jeppesen. The RNP program is another indicator of how the forward-looking airline is using technology to maximize efficiency, and reduce its environmental footprint. Jeppesen has extensive experience designing and developing RNP procedures for clients around the world and is uniquely positioned to offer a wide array of RNP services, such as RNP procedure maintenance, validation/comparison services on RNP procedure navigation data, charting and database coding for RNP procedures, FAA-qualified RNP consulting, and more. For additional information call 1-800-353-2108 or (303) 328-4422, or visit the RNP section of our website. In the Eastern Hemisphere call +49-6102-50-8180.